The Steelers failure to reach a long-term deal with Le’Veon Bell has prompted many fans to call for Pittsburgh to lift the franchise tag, let Le’Veon Bell walk and rely on running back by committee. During Mike Tomlin’s tenure, the Steelers have struggled to keep their 1st and 2nd string running backs healthy. The tendency took root in 2007 and has continued almost unabated since then. In 2007, Mike Tomlin vowed to run Willie Parker until “the wheels fell off.” The wheels fell off in week 16, forcing the Steelers to start Najeh Davenport in the playoffs with Verron Haynes coming off the couch as a backup. In 2008 the Steelers planned to use both Willie Parker and Rashard Mendenhall. A week 3 Willie Parker injury led to Mendenhall’s first start in week 4, where Baltimore broke his collar bone. Fortunately, the Steelers had solid running back depth with Mewelde Moore and Gary Russell filling the void until Parker’s return. The Steelers kept their top two running backs relatively healthy in 2009 and 2010, with Willie Parker only missing a handful of games in ’09. In 2012 the Steelers employed a variant of running back by committee, rotating carries and starts between Jonathan Dwyer, Isaac Redman and Rashard Mendenhall. Injuries contributed to this situation, but Mike Tomlin also wanted one of the trio to establish himself as the starter. None of them did. The Steelers unhealthy running back syndrom returned with a vengeance in 2013. Rookie Le’Veon Bell injured his Lisfranc in Latrobe, leaving Isaac Redman, LaRod Stephens-Howling and Felix Jones as the running back committee. Problem? LaRod Stephens-Howling’s Steeler career ended after 8 touches and Isaac Redman was already playing with injures that would end his career before Halloween. 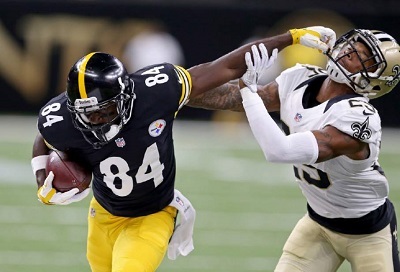 In 2014 the Steelers made a wise disciplinary move in cutting LeGarrette Blount, but that forced them to sign Ben Tate after Le’Veon Bell’s pre-playoff injury. In 2015 injuries and suspension limited Le’Veon Bell and DeAngelo Williams to 5 join appearances, and DeAngelo Williams season finale injury at Cleveland forced Pittsburgh to start Fitzgerald Toussaint and Jordan Todman in the playoffs. Any plans the Steelers had to spell Le’Veon Bell with DeAngelo Williams in 2016 went out the window when Williams injured his knee in week 6, limiting the tandem to 4 games together. And of course last season the Steelers only opted to give James Conner a handful of carries, but an injury against New England in week 14 forced the Steelers to sign Stevan Ridley two weeks before the playoffs. Calk it up to fate or chalk it up to mistake, but Mike Tomlin cannot seem to kept his top two running backs healthy, which doesn’t bode well for a shift to running back by committee. Or does it? Counterpoint: Could Running Back by Committee Be the Cure? In On Writing, Stephen King advises authors against plotting out stories in favor of putting characters in situations and then following them to their conclusion. King’s lesson is relevant to sports blogging, because sometimes your conclusions can morph into something else as you write. Mike Tomlin has seen his running backs suffer injuries early in the season (Parker and Mendenhall in ’08, Bell and Redman in ’13, Bell in ’15 and Williams in ’16.) But the most devastating running back injuries have occurred late in the season (Mendenhall in ’11, Bell in ’14, Williams in ’15, Bell in the 2016 AFC Championship). Both the laws of attrition and laws of probability would suggest that running back by committee could mitigate these dangers. That isn’t to say that the Chuck Noll’s offenses struggled to run the ball with Frank Pollard, Earnest Jackson and Walter Abercrombie. They didn’t. Nor could Mark Malone and David Woodley provide the type of air support that Ben Roethlisberger and Antonio Brown provide today. But Le’Veon Bell offers more to the Steelers 2018 offense than would a modern day equivalent of Pollard, Jackson and Abercrombie. And James Conners, Stevan Ridley and Jaylen Samuels have yet to prove they’re modern day equivalents of Pollard, Jackson and Abercrombie. But perhaps they can provide the type of quality and quantity of depth at running back behind Le’Veon Bell that the franchise hasn’t enjoyed since 2008…. 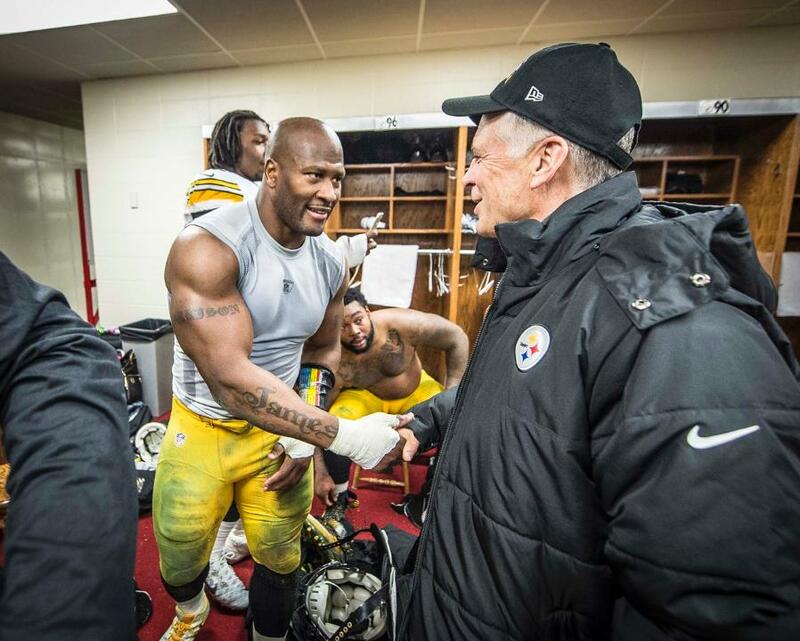 …You remember, the season that ended at Super Bowl XLIII. You’ll have to forgive me, but the only memory I have of former quarterback Steve Bono’s Steelers career is from my aunt through marriage. That’s it, that’s the only memory I have of the one-time scab, who once went 2-1 for the Steelers during the 1987 NFL players strike, before eventually departing for the 49ers and a few other NFL organizations during his 14-year NFL career that included stints with seven different organizations. But since this is a Steelers site, you probably want to know about Bono’s time in Pittsburgh. Bono was a sixth round pick of the Vikings in the 1985 NFL Draft, but did little of not in Minnesota before arriving in Pittsburgh as a free-agent signing in 1987. Bubby Brister, the team’s third round pick in the 1986 NFL Draft, as Mark Malone’s backup and starter-in-waiting, there wasn’t much for Steve Bono to be for the Steelers other than their third-string quarterback, which he was during the first two games of the 1987 campaign. However, the NFLPA elected to go on strike after two games, just like the union had done five years earlier. But, unlike the 1982 strike that resulted in a loss of nine regular season games, NFL owners decided to use replacement players to offset the ’87 work stoppage. While Steve Bono wasn’t exactly “scab,” having been around for two years without a real career break, he crossed the picket line and wound up starting all three games for the the Steelers strike replacement quarterback during the duration of the ’87 strike. Pittsburgh went 2-1 during the three-week replacement player era, and Steve Bono completed 34-74 passes for 438 yards, five touchdowns and two interceptions. Bono didn’t appear in any other games after the regulars returned in ’87 and only made two appearances for that infamous 5-11 ’88 squad, completing 10 of 35 passes for 110 yards, one touchdown and two interceptions as Todd Blackledge ultimately edged him out at backup quarterback. Perhaps mercifully (for him, not Pittsburgh), Steve Bono was allowed to walk after the ’88 season as the Steelers opted to hand their third string quarterbacking clipboard to Rick Strom. Bono did well for himself, as he signed a deal with the 49ers to be their third-string quarterback behind Joe Montana and Steve Young. History tells us that was a thankless and impossible task if one wanted playing time. But, in addition to earning two Super Bowl rings as an apprentice in both 1988 and 1989, Bono found his way into the starting lineup in 1991, thanks to back issues for Montana and multiple injuries suffered by Young. Steve Bono started six games in ’91 for the 49ers, and won five games, while completing 141 of 237 passes for 11 touchdowns and four interceptions. In his book, My Life Behind the Spiral, Young, a future Hall of Famer, talks about the frustrations of dealing with injuries, as he watched Bono lead an admittedly talented 49ers team to many victories in his absence. The fact that some of the more 49er fans claimed that Bono should be starting over Young undoubtedly contributed to his frustration. Steve Young ultimately reclaimed his starting job, and Steve Bono resumed his role as backup QB and remained in San Francisco through the 1993 season before signing with the Chiefs for the 1994 campaign. In Kansas City, Bono started 31 games in three seasons (Montana was with KC by then and was the Chiefs starter through ’94) and won 21 of them–including 13 in 1995–while passing for 6,489 yards, 37 touchdowns and 27 interceptions. Unfortunately for Bono, he could never quite get his Chiefs over the hump and played out his career as a journeyman backup for the Packers, Rams and Panthers, before leaving the game following the 1999 season. True, Bono was never anything special, but could he have bested the likes of Brister and, ultimately, Neil O’Donnell and Kordell Stewart in Pittsburgh? After all, Steve Bono had the benefit of playing behind legends the caliber of Montana and Young while with the 49ers and absorbing their wisdom. And what about his coaches in San Francisco? In head coach Bill Walsh and quarterbacks coach and then offensive coordinator Mike Holmgren, well, can you think of two better offensive minds? It’s easy to say Bono may have beaten out passers such as Brister and O’Donnell in Pittsburgh, but the fact is, the Steelers didn’t have anywhere near the level of talent the 49ers had in the late-80’s and early-90’s. Besides, Bubby Brister was pretty darn talented in his own right, and as for O’Donnell, well, it’s hard to top three division championships, two AFC title games and a Super Bowl appearance. Perhaps it is safe to conclude that, Steve Bono was probably a safer “game manager” than either the Bubster or Slash, but he also lacked Brister’s rifle arm and Kordell’s big play potential. And Bono would have been an upgrade at backup quarterback over Mike Tomczak. At the end of the day, Steve Bono was just a foot-note in Steelers history. Could he have been more than that? Steelers Nation is left to wonder. Since Chuck Noll ushered Pittsburgh into the modern era of pro football, the Pittsburgh Steelers have used 1st round picks on quarterbacks exactly 3 times. Their first came when they drafted Terry Bradshaw with the first overall pick in the 1970 NFL Draft. Ten years later they returned to the well, drafting Mark Malone with the last pick of the first round of 1980 NFL Draft. Steelers Nation would have to wait 24 more years until the 2004 NFL Draft for Pittsburgh to use another first round draft pick on a quarterback, and the decision to pick Ben Roethlisberger only really came at the behest of Dan Rooney who, by his own admission, was haunted by the teams decision not to draft Dan Marino thinking that the Blond Bomber had a few more seasons, instead of just 8 more throws, left in his arm. Although is return for 2017 is confirmed, since incumbent Steelers signal caller Ben Roethlisberger has publically as uttered the “R” word it is only fair to ask if the Steelers needs justifying picking a quarterback with their first round pick in the 2017 NFL Draft. Closing in on his 15th NFL season Ben Roethlisberger remains one of the NFL’s elite quarterbacks. 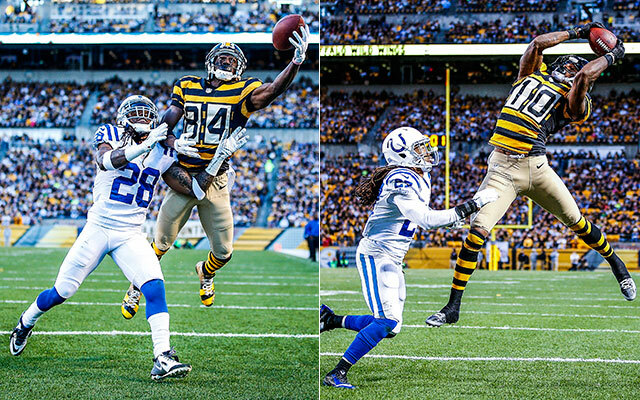 The Steelers Killer Bees, Roethlisberger, Antonio Brown and Le’Veon Bell give Pittsburgh its strongest concentration of talent at the skill positions since the days Lynn Swann, John Stallworth and Franco Harris lined up alongside Bradshaw. To judge solely by his passer rating of 95.4, Ben Roethlisberger 2016 season was almost identical to 2015’s (94.5). But that shows you how fickle of a measure passer rating can be as his completion percentage dropped by 4 points, but he threw more touchdowns and fewer interceptions and took fewer sacks. And he did it without the services of Heath Miller, Ladarius Green, Martavis Bryant, Markus Wheaton and Darrius Heyward-Bey for much or all of the season. If Ben Roethlisberger continued to prove that he was still a championship-caliber franchise quarterback during 2016, his game was not without its flaws. First, there was a sharp disparity between Ben Roethlisberger’s play on the road and his play at home. Beyond that, in the playoffs with Eli Rogers and Cobi Hamilton as his number 2 and 3 receivers the Steelers needed Ben Roethlisberger to make them look better than they were. Steel Curtain Rising has written more in defense of Landry Jones that he probably deserves, but such is the nature when two of a site’s writers style and ideas overlap. So be it. There’s no need to repeat our praise of the embattled backup here as Mike Tomlin and Kevin Colbert agree with Landry Jones is a viable NFL backup. If Landry looked lost in 2013 and 2014, the showed he belonged in 2015 and in 2016 he proved that the previous season was no mirage. No, the Steelers cannot expect to contend for a Super Bowl if Landry Jones has to start for an extended period. But you can say almost every other NFL contender can say the same thing about having to start their backup for more than a few games. Behind Landry Jones the Steelers have Zach Mettenberger, whom they picked up off of waivers. Both fans and columnists would prefer to seen Mettenberger holding down the number two slot and if he proves himself in training camp he may get that opportunity. When all is said and done, it could be that the Steelers decision to claim Mettenberger off of waivers will grow in importance to Kevin Colbert’s 2002 decision to sign Charlie Batch after the Detroit Lions cut him loose. At the time it looked like Charlie Batch was merely provided a fringe benefit of additional depth behind Kordell Stewart and Tommy Maddox. Ten years later we know that Charlie Batch grew into one of the best backup quarterbacks the Steelers have ever staffed. Can Zach Mettenberger follow the same script? At this point it is an unknown. 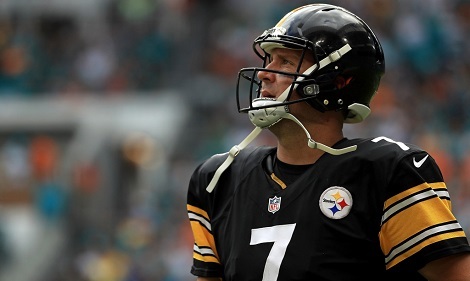 While Ben Roethlisberger might have sent shockwaves through Steelers Nation by admitting he needed to take time to decide whether he would play again in 2017, the fact is that he has made similar statements in private. That’s normal and even healthy thought process for a player to take at this stage of his career. If statements of Art Rooney II, Kevin Colbert and Mike Tomlin are any guide the Steelers expect Ben Roethlisberger to finish his contract. There’s a simple but unpleasant reality at work when it comes to the Steelers replacing Roethlisberger. Replacing one franchise quarterback with another is easier said than done. Sure San Francisco did it with Joe Montana and Steve Young. Green Bay did it with Brett Favre and Aaron Rogers. The Colts did it with Peyton Manning and Andrew Luck. It is pretty hard to find other success stories. The difficulty of trying to find your next franchise quarterback while your team still has one ranges somewhere between completing King Authur’s hunt for the Questing Beast and seeing Haley’s Comet – many try but only a few succeed. Even if Ben Rothlisberger’s retirement talk was serious, as Tony Defeo has argued, then it is still too early to think about drafting his replacement. Word is that 2017 NFL Draft is a weak one for quarterbacks, and even if it were not, the chances of a franchise quarterback slipping to the Steelers at the 30th pick are non-existent. If the Steelers can select excellent value at quarterback with their third or 2nd round pick then they might want to consider it, but barring that, focusing on players who help bring home Lombardi Number Seven in 2017 as opposed to trying to lasso a unicorn would represent a far wiser investment of Pittsburgh’s draft capital. 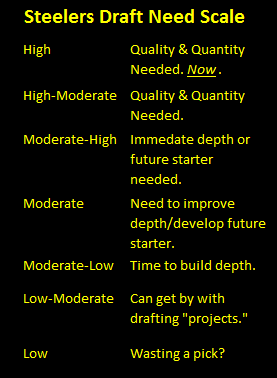 But when all is said and done, Ben’s public utterance of the word “retirement” doesn’t change any of the dynamics at work and the Steelers 2017 draft need at quarterback must be considered Low-Moderate. In case you haven’t been paying attention because you’re a little too busy gnashing your teeth over the Pittsburgh Steelers lack of free-agent activity, Pittsburgh inked backup quarterback Landry Jones to two-year contract that will average $2.2 million annually. If you have been paying attention or are just finding this out, chances are, you’re not very happy with this development. After all, you may be one of the many fans who consider Landry Jones the worst backup in the NFL. Why do you think this way? In addition to the four interceptions he threw in an exhibition loss to the Eagles at Heinz Field last August, Jones has looked kind of shaky in his 16 career appearances (four starts). He’s completed 85 of 141 passes for 1,071 yards, while throwing seven touchdowns to six interceptions. So why are Landry Jones’ numbers so underwhelming, so blah? Maybe it’s because he’s a backup quarterback, who has occasionally filled in for a franchise-caliber passer in one Ben Roethlisberger. 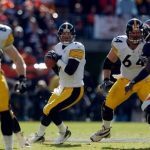 Good starting quarterbacks are a rare find, and those with the Hall of Fame credentials that Ben Roethlisberger possesses are even rarer. Therefore, when that guy’s backup takes his place for any length of time, the drop-off is going to be noticeable. Back to those simply good starting quarterbacks. Just how rare of a find are they? They are so rare, Brian Hoyer, a 31-year old journeyman quarterback with 8,600 yards and 31 starts on his resume, just got $10 million in guaranteed money to be the 49ers signal-caller over the next two seasons. Meanwhile, Mike Glennon, who hasn’t started a game in the NFL since 2014 and threw for just 75 yards last season, signed a three-year contract with the Bears for $45 million, with $18.5 million of it guaranteed. Will Hoyer and Glennon pan out for their new teams? That remains to be seen, but if either one of them winds up out of a job next season, that wouldn’t be a shocker. Last season, Brock Osweiler parlayed the seven starts and 1,967 passing yards he accumulated while filling in for the legendary Peyton Manning in 2015 into a four-year, $32 million contract from the Texans. After a more than forgettable stint in Houston, Osweiler is now a member of the Browns, who acquired him in a trade on Thursday (and word is that the Browns are trying to trade Osweiler to another team or could cut him outright). What’s my point in all of this? If it’s that hard to find a starting quarterback in the NFL, how can you expect the Steelers to find a better backup than Landry Jones? Are there better backups in the NFL than Jones? I’m sure there are. Would any of those backups lead the Steelers to a string of victories if Ben Roethlisberger were to suffer a serious injury? Probably not. Landry Jones has been in offensive coordinator Todd Haley’s system since Pittsburgh selected him in the fourth round of the 2013 NFL Draft. 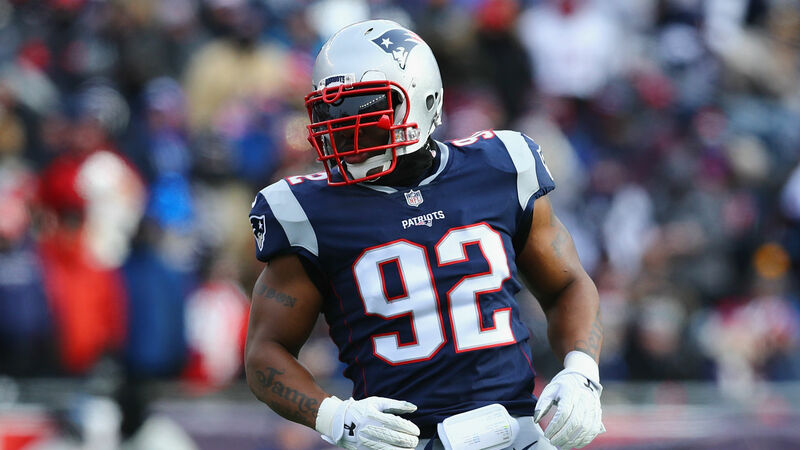 The reason Jones was brought in and groomed to be the backup was because the front office and coaching staff wanted someone who could step in at a moment’s notice and run the offense. You remember what happened two years ago, when Michael Vick was signed just weeks prior to the start of the season and thrust into action in Week 3, following an MCL sprain suffered by Roethlisberger. Mike Vick, who had only about six weeks to learn the playbook, was mostly ineffective, as the offense struggled mightily. Does the offense run like a well-oiled machine under Jones? No, but at least the playbook and the system both stay the same. In the grand-scheme of things, there is nothing less interesting to talk about than a team’s backup quarterback. Unless of course you live in Pittsburgh and the starter is Mark Malone, Bubby Brister, Neil O’Donnell or Kordell Stewart. 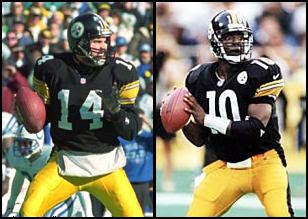 Then you positively LOVE talking about starting the backup quarterback until reality reveals that David Woodley, Todd Blackledge, and Mike Tomczak really didn’t offer the Steelers a better chance to win…. As we close, however, let’s concede that if Landry Jones becomes the Steelers starter for more than a couple of three games, Pittsburgh IS going to suffer for it. But let’s also remember that the same is true for just about any other NFL team, and that the Steelers could do worse at QB Number 2. Therefore, just accept the fact that Landry Jones is the Steelers backup quarterback. If you’re STILL fretting over that fact, then remember this – having Le’Veon Bell behind him and Antonio Brown in front of him will make Landry Jones a lot better quarterback. And besides, there seriously are more important things to worry about.